Blanc surprised us by starting Anthony Reveilliere at right-back and playing Debuchy in front of him at the right-hand side of midfield. Malouda was also preferred to Samir Nasri and as expected, Laurent Koscielny replaced the suspended Mexes. Del Bosque also had a slight surprise of his own in starting Cesc Fabregas as the false nine in place of Fernando Torres. All else remained as it were with the Spanish starting line-up. Blanc’s selection choices for this match always meant Spain would dominate possession. When Spain had the ball the French defence became very narrow and at times transformed in to a back five as Debuchy tracked back very deep from right midfield. In the spells of possession Spain had in the first half it was astounding the space France were allowing on their left flank. Blanc had clearly identified the threat of Alba and Iniesta on the left as the main danger and attempted to combat this with two right-backs on that side. 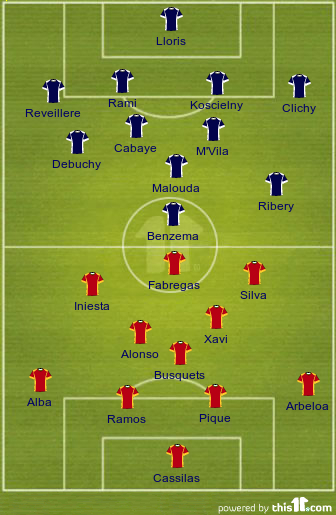 On the other flank Frank Ribery had very little defensive responsiblity and even though space was plenty over there, often with Arbeloa and Fabregas moving to outnumber the lone Clichy, Spain showed little intention to use that side as a path to attack. Ironically, even with two right-backs in the French side, the first Spanish goal came down that side. Iniesta fed a lovely pass for Alba to run on to and he broke free from Debuchy after a desperate attempt at the Frenchman to stop him. Alba then sublimely picked out Xabi Alonso ghosting in at the back post to head home the opening goal. Clichy looked as surprised as anyone to see Alonso drifting in late to score. That early goal on the 19th minute ruined France’s game plan and for the rest of the first half Spain tried to entice the French from their defensive barricade. France became more adventurous in the second half and started to exert their influence through possession. One of the easiest ways to see how strong this Spanish side is to see how hard France had to work to get the ball into the Spanish final third. Throughout the 90 minutes France created no real chance of note that they will look back on and believe they should’ve scored from. Blanc’s men did try to attack but it was obvious they were scared to open themselves up in fear of being caught on counter. Busquets and Alonso were absolutely marvelous at suffocating the sporadic pockets of French possession that reached as far as them. Benzema was starved of possession and in an attempt to become involved started to drift wider and deeper. In doing this he made a few excellent switches of play from the left to the right to Debuchy but this meant Benzema was far too often occupying unthreatening positions on the pitch. Blanc reacted during the second half by substituting in Nasri and Menez on for Debuchy and the invisible Malouda. Up to this point France, despite creating no real chances, had built up a passing rhyme and were getting the ball forward successfully. These two subs upset that rhyme. Nasri done more pouting and strutting than actual playing and he still looked peeved at Blanc’s original decision to drop him. Menez, who has earned the nickname Houdini for his ability to perform moments of magic on the pitch, lived up to his nickname in a different manner by performing a disappearing act and having no effect on the game except being booked. Blanc’s last throw of the dice was to bring on Olivier Giroud very late on. Any faint hope of a French equalizer were killed at the death though when Spanish substitute Pedro was clumsily fouled by Anthony Reveillere inside the box. Up stepped Xabi Alonso to take the penalty and he buried it, sending the goalkeeper the wrong direction and topping off a fantastic individual display by bagging his second goal of the game. Xabi Alonso was outstanding again. At times he and Busquets looked like the Bash Brothers out there as so little got by them. The gulf in class between the two midfields tonight was as stark as daylight and Alonso was central to this. His passing was as crisp as always, even outpassing Xavi himself on this rare night. Alonso’s opening goal was also especially decisive as it quickly rendered Blanc’ strategy useless. France couldn’t attack particularly effective with such a defensive-minded right side and when Spain scored the opening goal less than a quarter in to the game, it left the French floundering. The other two players who I thought so important tonight were Iniesta and Jordi Alba. Both put in sound displays tonight but they had a huge impact upon this game even before a ball was kicked. Blanc’s fear of them down Spain’s left led to him altering his entire game plan in an attempt to smother their influence and in the end this played a starring role in France’s failure to create anything of note tonight. This has to go to Blanc. There was a lot of logic behind the move to start both Debuchy and Reveillere. As soon as Alonso put away the header that logic became blurred. The French will all be extremely disappointed tonight as they ended up as just another notch on the Spanish bedpost. Perhaps regret will sink in and they will wish they at least had a real go at the Spanish. French football takes its pride in the flair and unpredictability of its heroes but tonight they went out on their knees.